apples | What Am I Eating? I hate peeling. Anything. Anything at all. I will cut up fruits, veggies and meats all day long, but I cannot stand peeling. Not a great thing, considering my profession. Dishwashers and prep cooks peel for me at work. But who peels at home? Well, usually, no one. I buy mostly Yukon gold potatoes and use them skin-on, the same for apples, pears, and almost anything else. Even carrots I cut up to use in stocks or sauces, peel on. Most of the nutrients reside on the outer surfaces of produce anyway, so my laziness translates into more nutrition for me! Yay! I really do prefer the taste and texture of fruits and vegetables with the peel on, in most instances. But, through experimentation I found one item in which the peel only takes away from the result. Applesauce. I do not mean the nasty baby food purée sold in jars on supermarket shelves. Gross. I mean homemade, tart and chunky applesauce with just the right amount of cinnamon. Unsweetened and untouched by chemical processes. If only someone would peel the apples for me. A freezer full of homemade applesauce waiting for me year-round? Heaven. I remember helping my mom with this freezer staple on sweltering summer and early fall days. Fine, “helping”. My definition of help included whining about how much I hated peeling apples, moping, and taking early tasters from the finished batches. Mom did not especially appreciate this kind of help. She told me if I wanted to snack, to make my own applesauce and not eat the batches she just slaved over. She also reminded me of how much I enjoyed eating the applesauce on my pancakes, waffles and french toast during the winter months. If I wanted to partake of those treats in the season where produce only comes from the grocery store, I must help her. I grudgingly agreed, and proceeded to sulk as I peeled endless mounds of green, red and yellow fruit. I appreciated all this effort when breakfast time arrived, and a pile of oatmeal pancakes topped with applesauce appeared on the table. Just hard to remember when elbow deep in apple peelings. Mom always microwaved the batches, but I remember how many boil-over issues this caused, which also led to the dreaded microwave cleaning. Ever tried to scrub cooked-on apple bits from the inside of a box? I do not recommend it. I prefer the stove top version. More time-consuming, but less mess. I love this applesauce stirred into oatmeal, as a sweetener for granola, with yogurt, breakfast foods (as mentioned before), topped with toasted nuts or simply by the spoonful. Not even close to the store-bought version, and outside of the peeling, very easy as well. Peel and quarter the apples. Core the quarters and cut each quarter into four pieces. Add apple pieces to a large pot. Add water and cook covered over medium heat, stirring occasionally, until apples soften and mush when stirred. Add more water if necessary. The cooking process can take up to an hour and a half, just be patient and keep and eye on the pot. Add the cinnamon and stir well. Remove from heat, cool slightly and serve immediately. 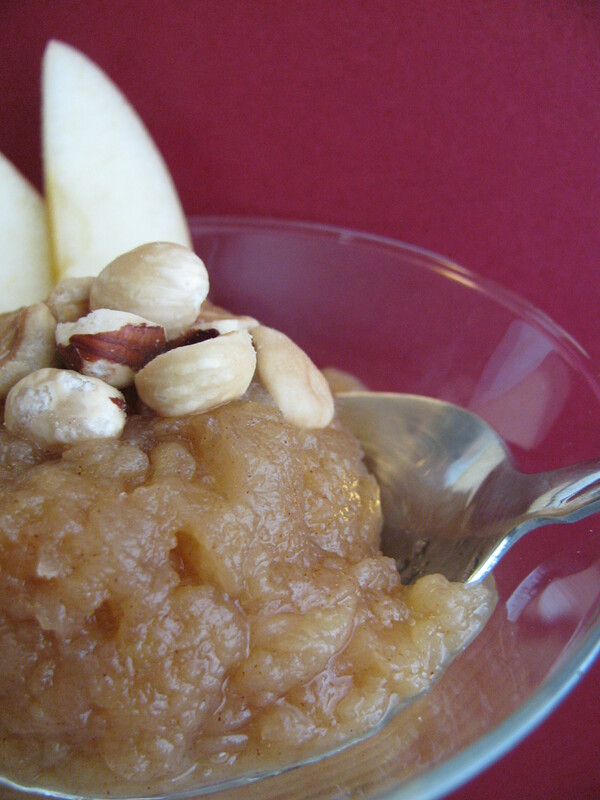 The applesauce can also be made in large batches and refrigerated or frozen. Great to make when apples are plentiful in the summer and fall.